Bulk Hotfix Rhinestones come in bags of 100 to 1000 gross, depending on size and color. Bulk stones are the ideal way to purchase for high volume users. 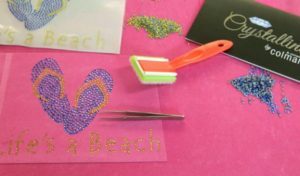 Typical bulk rhinestone customers have an automatic rhinestone transfer machine, like the CAMS from ColDesi, Inc., or are using a Brush n Bake Rhinestone Template System. Bulk Hotfix Rhinestones are available from 2mm to 5mm in size.